Several weeks before your cruise, you will receive detailed joining instructions to ensure that your arrival is as smooth as possible. Our vessels sail mainly from Oban in North Argyll, and from Greenock on the River Clyde, near Glasgow (located close to Glasgow International Airport). Our experienced reservations team can assist you with all your UK travel arrangements, including individually tailored packages, to make your journey to and from us as relaxed and as stress-free as possible so that you can enjoy your visit to one of the most beautiful and remote areas in Britain. Whether you would prefer the convenience of a chauffeur transfer, or the comfort of a private airport lounge, we will be only too pleased to cater for your requirements. Our reservations team can advise on flights from UK airports to Glasgow to meet with our luxury coach. We can also arrange private air connections to Oban, which has an airport capable of receiving private jets and where we can meet you with our luxury coach. We can recommend options for rail travel from/to your local UK railway station. For cruises commencing in Oban rail travel can be arranged to Oban station, with a superb and scenic journey three hours from Glasgow, and for Greenock, rail travel is to Glasgow. We will arrange our luxury transport to the yacht. If you wish stress free arrangements without needing to worry about your suitcases, we can recommend The Baggageman. please contact The Baggageman directly on 01844 264890 or visit www.thebaggageman.com., they will be happy to provide a quote. Guests travelling by rail or air to embark at Greenock or Oban can be collected at the railway station or airport and transported in our luxury transport to join us. Cruises with a different disembarkation port from the embarkation port include a return journey by our luxury coach to your point of embarkation. If you wish to travel to your port of embarkation by car we have secure car parking next to the berth. Coming from the south or east, Greenock is easily accessible from the M8, approximately twenty minutes west of Glasgow International Airport. Cars may be left in our secure free parking adjacent to our berth for the duration of your cruise. For Oban departures, the drive time from Glasgow takes between two and a half and three hours. Again free parking is availalbe. As an added touch of luxury, our door-to-door service option makes it possible for you to enjoy the comfort of chauffeur driven travel from most places in the UK to your embarkation port, or from any UK railway station or airport. Please enquire for more details. You may prefer to extend your cruise with a pre- or post-cruise hotel stay. We have negotiated favourable rates with a number of hotels, and we will be pleased to pass these recommendations on to you. The relationship our chef has with the environment is fundamental to the quality of food he prepares. A fisherman for many years experiencing first-hand what nature provides, it is essential that relationships with the chef and producers is a thriving and trusty one. Knowing that our chef will only accept the purest and finest quality produce ensures our guests experience the very best natures larder has to offer. Fine dining is a vital part of the perfect cruising experience. Your on board chef provides amazing meals from the very best of locally sourced produce at the peak of their quality. This not only enhances your dining but provides a much needed source of income for the local producers. The Royal Scottish Shipping Line takes special pride in the quality of our cuisine we are passionate about food and want to share this passion. Meals are generally served in the saloon at the handmade dining table on the main deck, where awe-inspiring scenery is on view through the picture windows. Whilst dinner is sometimes at anchor, breakfast and lunch are often taken en route to our next destination, as breath-taking landscapes roll by. In addition, we can offer, subject to availability, private dining within your cabin or alfresco on the rear deck, perhaps to celebrate that special occasion. After dinner, guests usually retire to our Whisky Bar on the Bridge Deck, for convivial conversation and entertainment. Weather permitting, barbecues are sometimes held on deck and ashore. As we are only occasionally alongside and often anchor offshore, landings are frequently made by our two ships tenders. 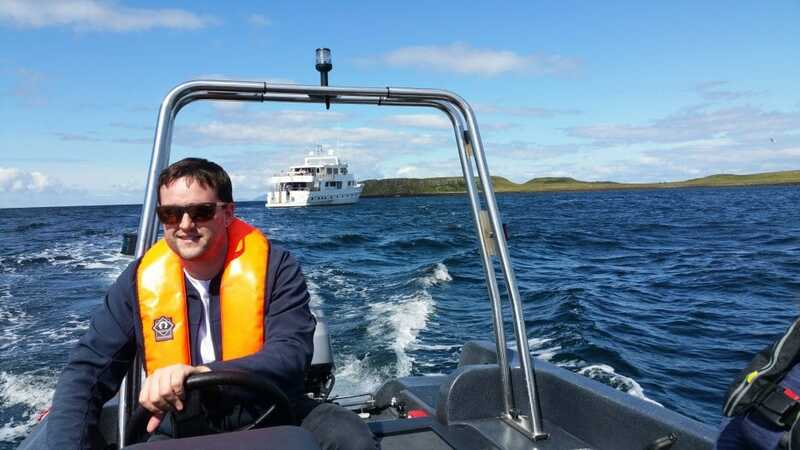 Trips in the tenders usually only take a few minutes and a high level of safety is observed by our experienced able-bodied seamen, who are always ready to offer a friendly word of reassurance and a steadying hand. They also shuttle to and fro during time ashore, allowing you the freedom to explore as and when you choose. Typically, the tender will land alongside a jetty or on a flat beach area where guests are assisted onto the beach by the crew. One of our tenders has a door landing platform to allow guests easy access to walk from the boat to land on one level. Enjoy the freedom of our daily shore trips, usually lasting up to 2 hours, where each passenger can choose to go ashore and explore, whilst some may wish to enjoy life and relax aboard the vessel. We carry a whole host of useful guides as well as weather products which you may well need such as sunscreen and umbrellas. We also have extensive information on board regarding the places you are visiting, as well as the crew being most knowledgeable. We will be happy to advise you regarding conditions. Highly knowledgeable and experienced guides are available on certain cruises and they will accompany your visits ashore. Whether exploring remote islands and historic sites, or simply taking in the magnificent scenery on board, you will appreciate their knowledge and insight of the spectacular areas. The guides evening talk is a convivial get-together in the Whisky Bar after dinner – and an ideal opportunity to relax over a coffee or a liqueur, whilst learning more of the tantalising places to come. In addition to our usual range of activities, the more adventurous can enjoy speedboat rides, fishing trips or cycling ashore on the ship’s bikes, all of which can be arranged on request. Our cruises board at 3 pm on the day of arrival and disembark at approximately 10 am on the day of departure. At times you will need the tender to board/disembark during your stay. 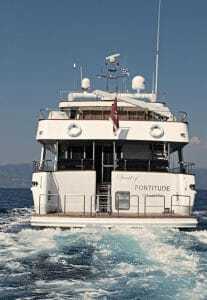 The Spirit of Fortitude has a very modern tender (landing craft) which lowers at the front to ground level so you have no need to step in but simply walk in and be seated. We have a very large lower swim platform which means very little step climbing or precarious manoeuvres to board your vessel. Your luggage will be collected and stowed aboard in your cabin by our experienced crew, which means that you can immediately start to enjoy your experience without the need of having to worry about getting your suitcases on board. There is no restriction on the size, number or type of suitcase(s) you may bring with you. They say knowledge is power! That’s why it’s always helpful to know as much about your cruise as possible, as this will enhance your experience. Cruising timetable: Our cruising grounds are some of the best in the world, but sometimes we can experience some unpredictable elements. For this reason, we tend to sail predominantly during daylight hours, often for short durations, with a typical itinerary seeing us sail for one or two hours after breakfast and for three or four hours after lunch, allowing guests the maximum opportunity to relax and enjoy the scenery. The Ships Master may occasionally decide to sail before breakfast if necessary, to reach a particular destination in good time or to take advantage of favorable weather conditions. Generally, we do not sail at night unless on longer passages. We will endeavour to operate to a predetermined itinerary. However, each route has a selection of lovely stopovers and anchorages and these are chosen by the Ships Master for any particular cruise according to the winds, tides and weather prevailing at the time of the cruise. This generally leads to a more enjoyable cruise for all, with the Master choosing the most suitable route for the comfort of all on-board. If there is a choice of anchorages available on any given day, the Ships Master will consult with the guests on board as to which to choose. The final decision on the cruise itinerary lies with the Ships Master. The following day’s daily ‘activity programme’ – comprising the intended navigation to be undertaken, any excursion activities, timings as well as other pertinent and interesting information – is posted each evening in the Main Saloon. Transport to and from your vessel and the shore is often by ships tender as we only occasionally lie alongside (see Going Ashore). Clothing suitable for the elements should be worn and if possible this should include waterproof trousers. Our crew will assist those with slightly less mobility. Part of the charm of our cruising grounds is that we can never really be sure of the weather, other than to know that it can be unpredictable. Bring plenty of warm clothing for you are likely to have some days when the weather is a bit cooler. Bring sun protection too as we are often blessed with glorious weather. Our crew are fully qualified First Aid Officers and there is extensive first aid equipment on board. We do not however carry a qualified doctor or nurse and we are often some distance away from high street pharmacies (or these may be open only at very limited periods) so please bring any medicines with you that you may need during the cruise. If you have any concerns about your medical condition or fitness prior to the cruise, please contact us immediately. Please let us know in advance about any special medical conditions (including allergies) that the crew should be aware of. We can keep any medication refrigerated if required, and any medical devices can be charged on board. Since we are never more than a few hours away from port, and most times less than an hour’s steaming, medical assistance can be arranged quickly ashore. At the beginning of each voyage the Master will conduct a detailed Safety Briefing highlighting all the emergency procedures and facilities on board. Whilst the ship generally operates an open bridge policy, during berthing or navigating in confined areas, guests should not access this area. Similarly, some deck areas will be restricted during these periods, to permit berthing operations and the stowing of fenders etc. Guests should at all times avoid those areas which specifically state for ‘Crew Only’. Life jackets are provided for each passenger and will be located within your cabin. Life jackets must always be taken on journeys in the ships tender, where they are required to be worn. Life jackets must be worn at other times when requested to do so by the crew. For security these are kept fastened whilst at sea. There is no lift on board. Guests with limited mobility can be accommodated provided they are accompanied by an assisting companion. Collapsible wheelchairs can be stowed aboard– please note that only limited use of any wheelchair can be made of whilst on board but they can be used on any excursions. Golf clubs will be welcome, but please let us know that you intend to bring them. We store some bikes on board so please enquire and bring your helmets! There are no restrictions on the type or size of luggage that you can bring with you (within reason), as each cabin has good storage space. Our crew will collect your suitcases from the shore and will deliver these direct to your cabin. Suitcases can be stowed in the compartments provided under the beds. Dress is casual, but on the last night a more Scottish theme is adopted so please feel free to tartan up! Our cruises are very relaxed and there are no specific requirements, with casual attire the order of the day. You may wish to dress for dinner but this is very much personal preference. Waterproof clothing will be required, particularly for the short journeys ashore in the ships tenders, or for those walks ashore. Non-slip shoes are best for on deck, and for the ladies high-heeled shoes are not permitted whilst on board, to protect the decks. Strong or waterproof boots are an invaluable aid for the shore excursions. Remember also sun protection and a hat for those gloriously sunny days. Our toiletries partner is Purdies of Argyll, Scotland’s own award winning organic manufacturer of shampoo, shower gel and soap. Hairdryers are supplied and a selection of towels are also provided which are changed during the week. Hairdryers are located in the top drawer of the vanity unit/desk in each State Room. We can offer a laundry service but a surcharge will be in operation and we do not accept responsibility for any damages caused. (Except in the case of the drying of outside wear). An iron and ironing board is available. Fresh towels and bed linen will be provided. Whilst the ship carries these, it is a good idea to bring your own so that you can take advantage of the breath-taking scenery at any time. Don’t forget this (or your charger for camera phone). We carry disposable cameras for sale in our on board shop. Our cruises are fully inclusive of all meals and snacks. This sometimes includes a picnic lunch or barbecue, and on occasion we sometimes dine in local hostelries. House wine is served with dinner along with soft drinks. The well-stocked Whisky Bar on the Bridge Deck caters for those wishing something stronger. Special requests for particular food and drink items can usually be provided by prior arrangement. 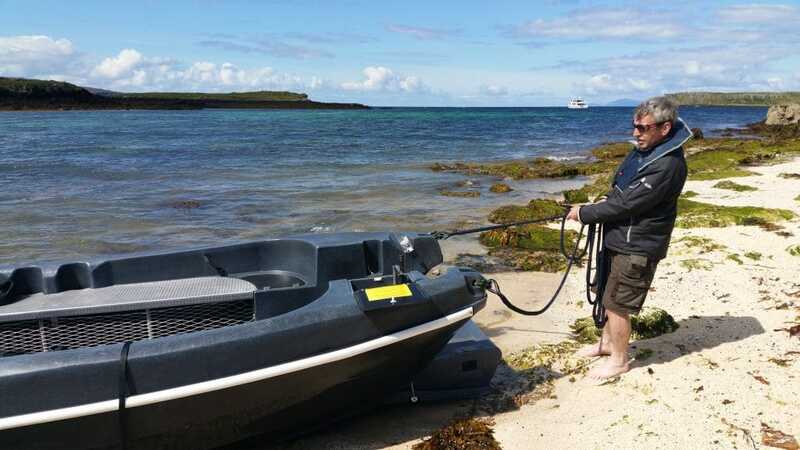 Mobile phones are in range for most of the voyage(s), but please note some blind spots do exist, particularly in the remote lochs and islands. Unfortunately for the same reason WIFI connection is not always available. You will be able to charge your phone whilst on board. The ship will always be able to make contact with the shore in the event of an emergency. A ‘running tab’ cashless system of payments operates on board for your bar, shop and laundry bill. A detailed account of purchases made, are available for guests to check & settle on the penultimate day of the voyage. Accounts can be settled in cash, or by Visa or MasterCard credit or debit cards. American Express or Diners are unfortunately not accepted at this time. A safe deposit box is located inside the wardrobe of each cabin. The boat’s electricity is 240V AC and standard UK 3 pin sockets are provided in cabins. It is a good idea to make sure you have a surge protector plug with you to protect your equipment. The ship is contactable in almost all possible eventualities. However, in the first instance if you wish to leave an emergency contact number with your family at home, please use +44 (0) 1577861121 and we will then contact you via the Ships Master. If you do want to leave a gratuity, please give it to the Ships Master who will ensure it is shared equally between all crew members. The Ship operates a no smoking policy in all of the interior areas, including cabins. Alarms are fitted throughout the vessel. Smoking is restricted to a small area of exterior deck only, and only at certain times i.e. no smoking at all during manoeuvring operations. We have a stock of items you may have forgotten to bring for sale on board. House wine is complimentary with dinner, and there is a well-stocked bar from which you can purchase a wide variety of alcoholic beverages. Complimentary tea, coffee and snacks are available throughout the day in the main saloon. You can also have these in your own cabin. Fine dining is a vital part of the perfect cruising experience. On board, we take special pride in the quality of our cuisine, prepared by our expert chef from locally sourced produce. Meals are generally served in the saloon dining table on the main deck, where awe-inspiring scenery is on view through the picture windows. Whilst dinner is sometimes at anchor, breakfast and lunch are often taken enroute at the rear dining area or saloon to our next destination, as breath-taking landscapes roll by. In addition, we can offer, subject to availability, private dining within your cabin, or alfresco on the rear deck, perhaps to celebrate that special occasion or just that private time. After dinner, guests usually retire to our Whisky viewing room on the Bridge Deck, for convivial entertainment. Weather permitting, barbecues are sometimes held on deck and ashore. Most of the usual dietary requests can be arranged providing prior notification is made. We do not have a pre-set agenda in terms of entertainment but our ships are well equipped with televisions in the main saloon and in every cabin, although our cruising grounds sometimes means that antenna reception is not available. We carry a large DVD library, as well as a reading library, board games and musical instruments. The library is available for all. It includes a large desk area, where you can sit and watch the scenery pass from the panoramic windows. It includes a selection of games and reference books. The right to courteous and well trained and professional crew (STCW International standards) at all times. The right to a full refund for a trip that is cancelled due to mechanical failures, or a partial refund for voyages that are terminated early due to those failures. The right to a ship’s crew that is properly trained in first aid, emergency and evacuation procedures. The right to transportation to the ship’s scheduled port of disembarkation in the event a cruise is terminated early due to mechanical failures. The right to have included on the website, a phone line that can be used for questions or information concerning any aspect of shipboard operations. The right to make an emergency phone call if needed. The right to total privacy, confidentiality and discretion from all our staff. Type: Twin Screw Diesel Motor Yacht. Construction: Steel hull superstructure and teak laid decks on steel. Engine type: 2 x Caterpillar 3406 450 hp. Generators: 1 x Fiat lveco 30KW, 1 x Deutz 17KW. Water maker: 2 x Horizon (400 – 450 Lt/ HR). Grey waste water: 9,413 litres. Black waste water: 9,413 litres. Air conditioning: 7 x Marine Air units BTU 900,000 total, individual controls in each cabin. Fuel Filtration: OEM built with day tank. Sewage System: Gravity fed tank with sludge pump, macerator. Fresh water system: 2-heater process plus 1 spare. Steering system: Data 1,700 hydraulic. Intercom System: Telephone system throughout. Ships Communication: 4 portable walkie talkies. Radar: FURUNO FR 7 III radar 36 mile range. Navigation: Electronic navigation system with 17 inch display. GPS: FURUNO GP-188 (1) and Lowrance (2). Grill: portable electric TEFAL grill. Refrigerator/Freezer: Frigidaire type with 115 gallon with 21 gallon freezer. Icemaker: Icerette icemaker in saloon. Anchor Windlass System: DATA hydraulic. Anchors: 2 x ships cast eye type anchors 485 lbs each. Deck Capstans: 1 x Data (hydraulic) on stern deck. Tenders: 5.20m Novamura RIB with 60hp outboard. Pioneer Safety Boat with 30hp outboard and landing craft door. Additional Cranes/Davits: 1 x 800kg capacity electric crane for tender lift. Stern Boarding Gangway: Electric gangway. Life rafts for up to twenty six. Life jackets (children and adult). Automatic engine room fire extinguishing system (CO2). New stainless steel hand rails, on all levels. SART Search and Rescue Transponder. Portable fire extinguishers throughout the vessel. Sea Water Firefighting ring main with sea water lift pump. Bridge navigation watch system (BNWS). The Company will not be held responsible for, nor have liability in respect of, delays caused by third parties during passage through sea areas controlled by vessel traffic schemes, canals, rivers or any other navigable waterways. The Company reserves the right at any time to require any Passenger to produce medical evidence of fitness to travel including the submission of any required medical certificates, for example in cases of heart problems which have incurred in recent times etc. Any Passenger due to board or boarding the vessel must as soon as any condition becomes known, or at initial embarkation fill in a pre-boarding health declaration form alerting the Company of any sickness and/or diarrhoea experienced less than 48 hours prior to embarkation. In the interest of Passenger’s safety, the Company reserves the right at its discretion, to refuse to board any passenger. In such circumstances the Company shall not be liable to pay any compensation, nor shall Passengers have any further claim against the Company. Passengers affected by a disability or medical condition must be self-sufficient or travel with someone who can provide the necessary assistance at all times. At the point of embarkation, the Company reserves the right to refuse passage to any Passenger who had failed to notify the Company at the time of booking of any disabilities or the need for assistance or who, in the opinion of the Company is unfit to travel or who may constitute a danger to themselves or others whilst on board. Under those circumstances, Passengers will receive no refund of the cost of any part of the unused cruise package. The Company will endeavour to carry Passengers of limited mobility if it has been notified of such limitations at the time of booking (and has been informed of any deterioration in condition or new conditions between booking and travelling). Any cost or expense reasonably incurred by the Company for or on behalf of the Passenger in respect of any form of medical, dental or similar treatment, hotel, transportation, repatriation or any other expense shall be repayable by the Passenger to the Company irrespective of whether the sum is covered by the Passenger’s travel insurance arrangements. Unless approved by the Company in writing prior to departure, Passengers may not bring on board any controlled substances. Passengers acknowledge and understand that travel by sea carries the inherent risk that medical care may be delayed or impossible due to the location of the Vessel, prevailing weather conditions or other. Passengers may not bring on board any prohibited substances, any animals or any goods of a flammable or dangerous nature. Doing so will render the Passenger strictly liable to the Company for any injury, loss, damage or expense suffered by the Company as a result. The Passenger will also be personally liable for any statutory penalties. Passengers are required at all times to follow the instructions of employees and crew regarding the use of ship’s equipment and general behaviour whilst on board and the Company will not be responsible for any consequential injury, illness, financial or other loss incurred by Passengers if they fail to comply with the instructions they are given. The Captain ( or member of the crew authorised by the Captain ) will be entitled to search the cabin and/or personal luggage of any Passenger suspected of being in breach of these clauses. In addition, any employee or crew member will be entitled to enter a Passenger’s cabin in order to carry out an inspection, or to undertake cleaning, maintenance or repair work, or to make the vessel safe for passage. In the rare event, the Captain reserves the right to inspect the person if it is thought that the passenger has a controlled substance. The Company shall be under no liability whatsoever in respect of any claim arising from an accident which was not reported by the Passenger to the Captain whilst onboard the Vessel. Pregnant women are required to supply a medical certificate attesting to fitness to cruise. Any Passenger who encounters a problem during a cruise must immediately report it to the Captain or a senior member of the crew on the ship and ensure that the issue is recorded in the ship’s log together with any action taken to resolve it. In the event that the scheduled date of embarkation is delayed and accommodations are not available on board the vessel, the Company may, at no additional expense to the Passenger, arrange hotel accommodations for the Passenger for the duration of the delay. In the event that the scheduled port of embarkation is changed, the Company will, at no additional expense to the Passenger, arrange transportation from the original port of embarkation to the rescheduled port of embarkation. If the Cruise has commenced and the Passenger, for any reason, is unable to complete the Cruise, the Company shall not be liable to the Passenger for any refund. In the event that the duration of the cruise is lengthened, Passengers shall not be entitled to any compensation from the Company for the lengthened cruise. The Captain shall have the full authority to tow and be towed, and to assist other vessels. In the event that any scheduled port of call is omitted, or if the duration of the cruise is shortened for any other reason, the Company’s sole liability to Passengers, if any, shall be to make a pro-rata refund to the Passenger of the cruise portion of the cruise fare received by the Company based on the number of whole days the cruise is reduced. The Company will not be liable for any reduction of cruise length which is less than twenty-four hours.